U.S. Environmental Protection Agency (EPA) official Gary McNeil presented the 2013 Energy Star CHP Award to Jim Riley, together with Les Williams, UES director, and David Payne, UES associate director, at the International District Energy Association Campus Energy Conference in San Diego on February 20, 2013. 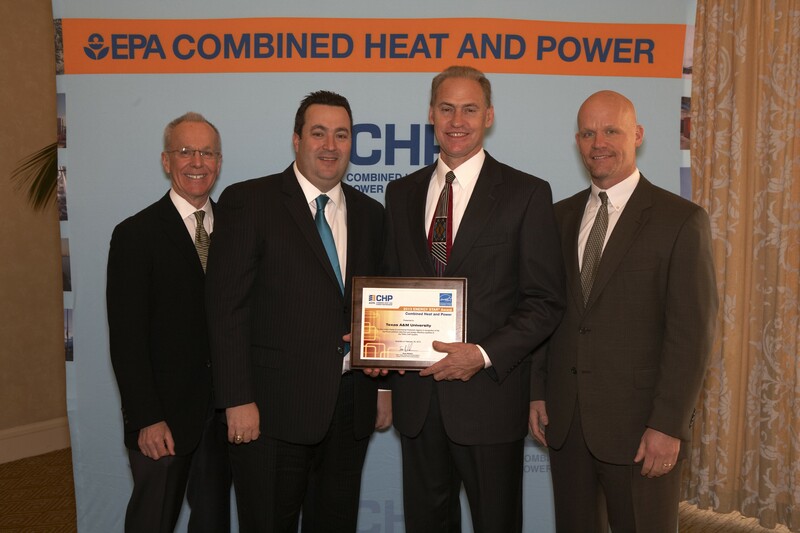 EPA awards the ENERGY STAR® CHP Award to leaders who increase the nation's electric generation efficiency through the development of highly efficient combined heat and power (CHP) projects. The EPA has taken special note of Texas A&M University’s energy efficiencies resulting from the installation of a combined heating and power system completed in 2012 that requires one-third less fuel than a typical off-campus power plant with similar output. Texas A&M's CHP system is designed to operate and remain fully functioning during a power outage, ensuring that critical operations can continue without interruption. The system's ability to operate independently from the grid ensures power reliability for university facilities, including numerous research facilities, dormitories, and a veterinary hospital. CHP has played a key role in reducing the University's energy consumption by more than 40 percent per square foot over the last 10 years, resulting in nearly $150 million in savings. Read the entire TAMU-Times article.